In this article, we will be creating a sample REST CRUD APIs and provide JWT role based authorization using spring security to these APIs. We will be using spring boot 2.0 and JWT 0.9.0. In the DB, we will have two roles defined as ADMIN and USER with custom UserDetailsService implemented and based on these roles the authorization will be decided. We will be using spring data to perform our CRUD operations and spring provided annotations such as @PreAuthorize, @Secured and @EnableGlobalMethodSecurity for authorization. At the end, we will be testing it with postman. In my previous articles, we have discussed a lot about Spring Boot JWT Auth, JWT Angular Auth and Spring Boot JWT OAuth but in these cases, we had hardcoded the user role in the code and it does not provide much sense in real-time applications. But it definitely provides a good way to get started. Hence, in this article let us have a full-fledged project to provide JWT role-based authorization to REST APIs. JSON Web Token (JWT) is an open standard (RFC 7519) that defines a compact and self-contained way for securely transmitting information between parties as a JSON object,a stateless authentication mechanism as the user state is never saved in server memory.A JWT token consists of 3 parts separated with a dot(.) i.e. Header.payload.signature. Following is a sample JWT token. Following is the maven depencency that we have defined in our pom.xml. Now, let us define WebSecurityConfig.java that has all the configuration related to our spring security.Here, we have configured that no authentication is required to access the url /token, /signup and rest of the urls are secured. Here prePostEnabled = true enables support for method level security and enables use of @PreAuthorize and similarly to enable @Secured annotation we require securedEnabled = true. 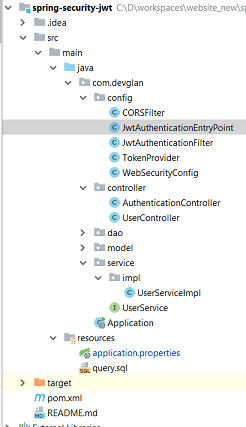 Following is our AuthenticationController that has API exposed to generate JWT token. Following is th snippet from TokenProvider that is responsible for validating user and generating JWT token. Now let us define our model classs - User and Role. It has many to many relationship. Visit here for detail explanation on hibernate many to many relationship. The passwords are Bcrypted as password1, password2, password3 for corresponding users user1, user2, user3. Also, you can use online Bcrypt tool to generate your own bcrypt password. This will be simple project structure. We will have all the base package as com.devglan and all the security configs inside config folder. Similarly, all the controllers, service and DAO will be in their corresponding folder of controller, service and dao. Following will be the final structure. In this article, we learned about creating a sample REST CRUD APIs and provide JWT role based authorization using spring security to these APIs. The source can be downloaded from the github link.If you liked this post, I would love to hear back in the comment section.